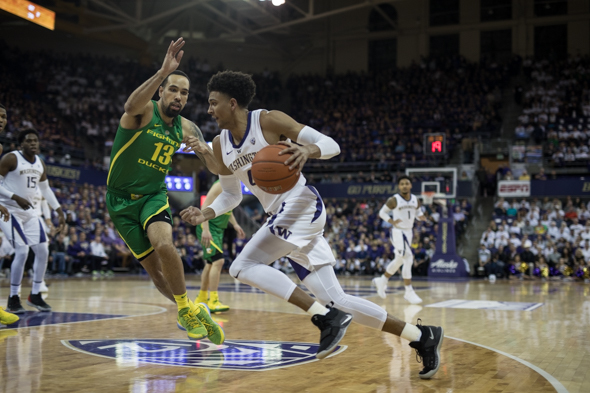 The Huskies had three selections on the Pac-12 all-conference team, and Matisse Thybulle was all defense again. Matisse Thybulle and Jaylen Nowell, dominant forces that led the Washington Huskies to the Pac-12 Conference regular-season championship, were named to the 10-member All-Pac-12 first team Monday, as was Washington State’s Robert Franks. UW’s Noah Dickerson was an honorable mention. It was the fifth time in Pac-12 history UW had three selections. Thybulle also made the five member all-defense first team for the second year in a row. A senior, Thybulle started all 130 games of his career and this season tied the Pac-12 single-season steals record (110), matching Cal’s Jason Kidd (1992-93). He is the only Division I player in the past 20 seasons with 100 steals and 70 blocks in the same year. His 72 blocks rank third all-time in UW single-season history. Thybulle averaged 9.5 points and 3.1 rebounds. Sophomore Nowell, honorable mention a year ago, led UW in scoring with 16.3 ppg and also had 5.4 rebounds per game. He dished out a team-high 97 assists (3.1 per game) and reached 20 points nine times. He improved his field goal shooting to 50.4 percent from 45.1 a year ago and his 3-point shooting to 42.7 from 35.1. He was the first UW player since 2011-12 (Isaiah Thomas) to earn three Player of the Week awards. Senior Dickerson had 22 double-figure scoring nights, including five of 20 points or more. He averaged 12.9 points while shooting 57.4 percent from the field and led the team in rebounding with 7.2 per night. He moved into the top 10 all-time in UW career scoring and rebounding, making him the sixth UW player with a 1,500/900 combo. The all-conference awards were made by a vote of Pac-12 coaches. The Pac-12 tournament begins Wednesday in Las Vegas. The top-seeded Huskies, regular-season champs for the first time since 2011-12, have a first-round bye and play at noon Thursday (Pac-12 Networks) against the winner of the 8/9 game between Arizona and USC. A well deserved honor for this trio. I’d like to see Nowell stay one more season but I’m sure he’s weighing his professional options. Not much to prove in college. IMHO, he still needs to hone his game and mature. As much as UW has been sending players to the pros since Lorenzo Romar took over the program none of them have made an impact beyond Brandon Roy. It’s the difference between being a journeyman and an All-Star. Becoming an All-Star in the NBA, given the influx of great European players, is a huge feat. The fact that numerous Huskies have been journeymen is a big deal. And don’t forget Isaiah Thomas.